There has been a lot of people asking about the Clash Royale chest order and when you get each chest: magical, gold, silver, giant, and super magical. A lot of people believe you have a percent change to get a chest, but there is actually a very specific cycle for chests to follow. 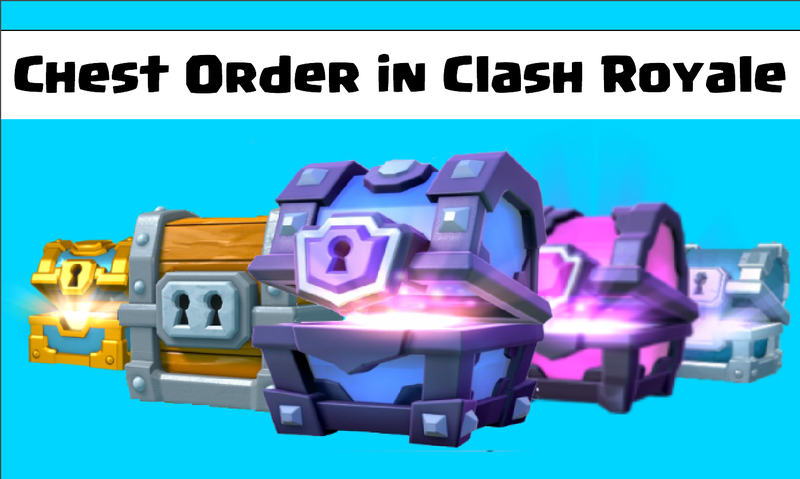 What is the Chest Order in Clash Royale? So Clash Royale has a 240 chest pattern that is constantly followed, but does not include super magical chests. Who knows how to get those…! But for every 240 wins WHEN YOU HAVE A CHEST OPENING, these chests will be the order in which you receive them. Of course, the order is insanely long and I can’t post the whole cycle here, but it is long and complex. However, I did count up how many of each type of chest you get within the 24 chest sequence. So basically this is what you will get for every 240 chests in the game, with a super magical chest CHANCE thrown in there. Hope this helps you guys figure out what chests you can get! ← Clash of Clans New Troops in the Next Update? Once a friend of mine just got to royal arena, and didn’t want to battle because he is afraid he will drop out, and he said he is just going to harvest free chests for a while. I was sitting next to him, so I reached over and pressed battle for him, and he didn’t cancel fast enough. He battled, won, and got a super magical chest. That was the craziest luck I have ever seen. THATS WHAT HAPPENED TO ME! I was at 1960, won, got a super magical chest from Arena 7 because the person I battled was in there and got the princess from it which wouldn’t have happened if I didn’t battle that guy. Pingback: Clash Royale Chest Order/Cycle | Clash of Clans Guide, Strategies, Tricks and More!